Under the parish Way Wardens the local roads had been indifferently repaired and maintained such that travel beyond the town was infrequently undertaken by most people. This, of course, restricted the trading ability of the town to a great degree. The Turnpike Commissioners ordered that "three capital gates be erected" at Hendford Bridge, by today's Railway Tavern, Goar Knap which was roughly near the junction of St Michael's Avenue and Sherborne Road and "the Head of Kingston" at Fiveways. Collectors at each of these gates received a salary of six shillings per week or "eight shillings until the toll houses are completed". Richard Slade was elected collector of the tolls at Kingston Gate, William Chead at Hendford and Thomas Swetman at Goar Knap. There was also a "stop gate near the entrance leading from Pen Stile to Newton” with John Gregory being appointed collector there at a salary of 2s 6d a week. There were eventually other gates at Watercombe Lane, Combe Street Lane, Goldcroft and Dorchester Road. In its edition of 12 November 1764 the Caledonian Mercury reported "Last week a horse in a cart, near Yeovil, taking fright, leapt over one of the turnpike gates (which is near five feet high) and pulled the cart quite over, without receiving any damage." In 1825 the Turnpike Trust made improvements to the London road by diverting it up Babylon Hill and at the same time Hendford Hill’s gradient was lessened by the creation of a cutting below the Quicksilver Mail. At Cemetery Hill on Preston Road the road was widened and lowered at the same time. In 1852 in his Report to the General Board of Health concerning, among other items, the condition of Yeovil's roads, Thomas Rammell wrote “The Turnpike roads of the parish are under the management of trustees called the Yeovil Turnpike Trust, and are repaired by their own Surveyor. About £60 annually are expended on the bye-roads of the parish without the town. 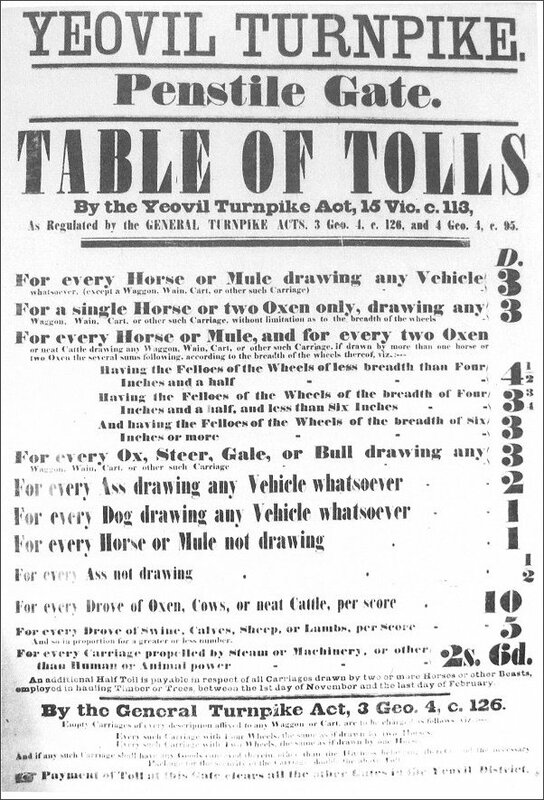 Toll gates are situate at all points round the town, but not so as to interfere in any way with its traffic.” At this time the toll paid for a horse not drawing was 1½d and drawing, that is, pulling a cart or suchlike, was 4½d (58p and £1.73 in 2017's value). One turnpike highway ran from Hendford to Cuthedge (on the Crewkerne road by the Camp Road turning to Odcombe) with a toll gate at Hendford Bridge (next to the Railway Tavern) and a toll-bar at the junction with the Dorchester Road. In the 1871 census the Dorchester Road turnpike gate was operated by Scots-born Robert Noble, a sergeant Chelsea pensioner, who lived there with his wife Fannie. Rammell, writing in 1852, commented "The trustees lately removed the Hendford Gate from the bridge to the top of the hill, a distance of a quarter of a mile, in accordance with a wish expressed by the townspeople." The Goar Knap gate was moved a few hundred yards east to Yeovil Bridge and the tollhouse, which remains to this day, was built in 1856. The Kingston toll house was rebuilt about a hundred yards from its original position when the Yeovil Turnpike Trust was abolished in 1875 and at the same time all of Yeovil’s toll gates, stop gates and side gates were removed. The Kingston toll house was finally demolished in 1969 when Kingston was widened. 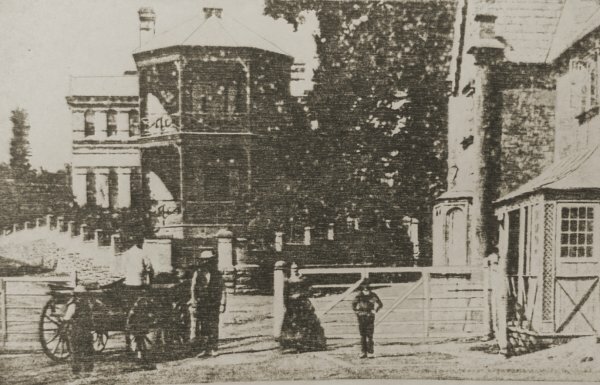 The Penstile toll house, with its stop gate, had originally been sited at the junction of Pen Style and Newton Road (hence its name) but in the latter part of the 19th century it was re-built in its present position on the corner of Newton Road and South Western Terrace. It is now named Newton Lodge. The toll house on Mudford Road, at the junction with St Michaels Avenue, again dates to the mid-19th century. It is now named Turnpike Cottage. Dating to around 1872, this is probably the earliest photograph of the new hospital at Fiveways. Photographed from Kingston and showing the Kingston Toll Gates. These are mile markers erected by the Yeovil Turnpike Commissioners, probably in the 1850's. At left is a two-mile marker located by the White Post garage on the West Coker Road, at the Camp Road turning. The metal plate design is known officially as the "Yeovil roll top plate". The central photograph, a one-mile "Yeovil roll top plate" marker, is located in a garden wall on the West Coker Road, between Danielsfield Road and Hillgrove Avenue. The broad Arrowhead carved in the stone below the plate is an Ordnance Survey benchmark used in surveying. The third mile marker is located in a garden wall on the Ilchester Road, nearly opposite the old Picketty Witch. The style of this marker plate is officially known as the "Yeovil gable plate". A poster of 1852 displaying the charges for access through the Penstile Gate.